Today’s feature is an obscure but pretty nature name. 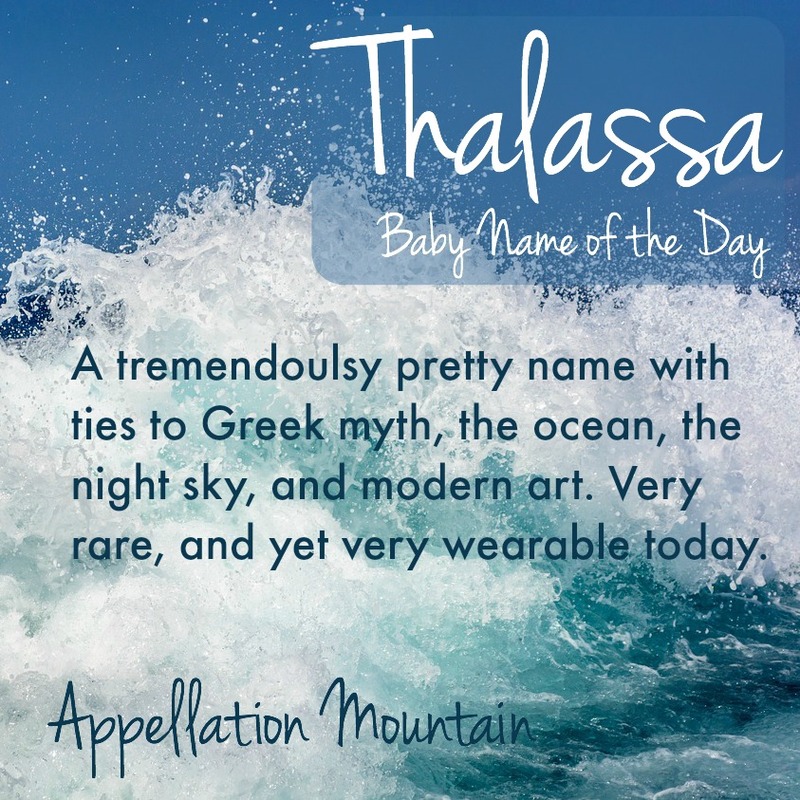 In honor of the good ol’ summertime, our Baby Name of the Day is Thalassa. Thalassa comes to us from Greek myth. She’s one of the primordial goddesses, sometimes seen as the personification of the ocean itself. Thalassa is the Greek word for sea. Like many a minor goddess, we only know so much about her. When in human form, she’s often depicted with crab claw horns, dressed in seaweed, holding an oar. 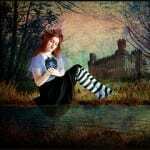 Aesop liked to include her in his tales. In more than one story, a man is cursing the sea, when suddenly, the waves form a woman. In one account, she tells a shipwrecked sailor that she’s not to blame for his misfortunes, but the Winds –for I am by my own nature as calm and firm even as this earth; but the winds suddenly falling on me create these waves, and lash me into fury. She’s also the mother of the fishes. In some accounts, the Telchines – mysterious sea creatures who invented the craft of metal-working – are also her children. 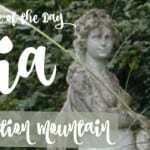 So is the nymph, Halia, whose daughter Rhodos would lend her name to the Greek island. In 2011, the New Orleans Museum of Art installed a huge paper cut installation called Thalassa in their atrium. It was created by the artist known as Swoon. (Her real name is Caledonia Curry!) New Orleans has historic ties to the sea, and a recent history of devastation following Hurricane Katrina and an oil spill. Swoon was inspired by the latter event – her goddess is about connecting to nature, but also about the damage man has done. Neptune is named after the Roman god of the sea, and so it is fitting that Thalassa is the name of one of Neptune’s moons. Voyager 2 discovered the satellite in the 1980s, and was officially announced in September 1989. The chalky white blur in the picture is one of the images Voyager 2 captured that allowed scientists to confirm the moon’s existence. The name has only been given to more than five girls born in the US in a single year once. In 1977, there were six newborn Thalassas. The discovery of Neptune’s moon couldn’t do it. A character on a 1968 episode of Star Trek couldn’t do it. And the installation art in New Orleans garnered lots of press, but inspired few parents. The 1970s Thalassas might be inspired by Thalassa Cruso, star of a weekly public television show about gardening called “Making Things Grow.” She also authored a book by the same name, and went on to appear on late night television with Johnny Carson. 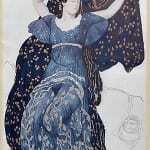 Why hasn’t Thalassa caught on? In recent years, American parents have avoided names that start with Th. But with the rise of Theo and Theodore for boys, and the return of Thea for girls, that’s starting to change. Thalassa is as romantic as Isabella, and as much a nature name as Luna. It’s the perfect choice for parents after something unexpected, but with a story to tell. What do you think of Thalassa? Is it an underused gem, ready for discovery? Or is this one too much to wear? It’s rare – less common than Taylor as a surname, and FAR less familiar as a given name. But I think it would wear well. 51 boys were given the name in 2014, so that’s pretty rare – but it’s not completely unknown. I LOVE LOVE LOVE Thalassa, I’m certain you are aware by now, by how much I’ve spoken about it. My favorite combination is Thalassa Berengaria. Anyway, I’m happy the name hasn’t caught on, it keeps it rare and refreshing. Thanks for writing a post on the name. I love the ocean, and nature names, so this is a name that will stay on my radar. Is the stress on the first or second syllable? The TH is pronounced like you would with Theodocia. The stress is on the second syllable.